As in the description said, vehicles will display their low LOD model always after ~90m distance. Using engineSetModelLODDistance(498, 300) does nothing, however, in my opinion, this should enable rendering the high LOD model up to 300m instead of just 90. The question is: should I keep scrollbar with values between 30 - 250 or maybe just create tick "Render vehicles always in high quality"? On my server I need all vehicles in full quality because of long-range (300m) tank engagements. The lowLOD doesn't show the tank turret. Personally on my system I would enable Max quality. Maybe the best option would be to keep the scrollbar but the highest value should be "always HQ". A scripting function to force the HQ model would be nice Aswell, I could delete all LODs from my 24 vehicles and save some Memory. A check box is preferable. How does the script function interact with the option setting? Thanks for bump. Meanwhile I changed scrollbar to checkbox and I dropped support for boats (for simplicity, I'm patching only 2 addresses now), they use general vehicles distance now. I set limit to 500 which is a bit more than streaming distance. 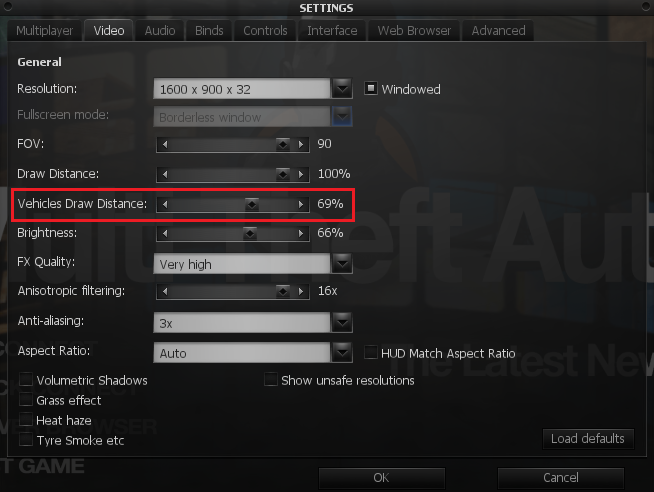 setVehiclesLODDistance() will override user setting and resetVehiclesLODDistance() will reset value according to checkbox. God, thx i will try this so hard asap. Where should the 10€ go then? Already implemented and will now be tested for the future. Works great and just as planned so far.